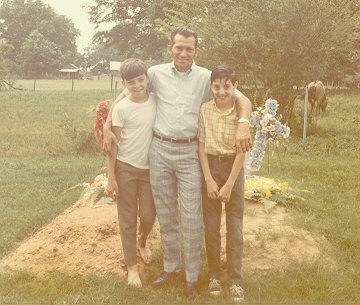 This blog post is another in a series connecting the dots in my tree to the souls buried at Bairdstown Cemetery in Bairdstown, Oglethorpe County, Georgia. In July 2017, I wrote about the one DNA match that I truly cared about. That would be the one where DNA proves my grandpa Carroll Lankford’s connection to the Janes family of Greene County, Georgia. You can read about it here if you missed reading it when I posted it. Instead, I went to the new ThruLines web page on Ancestry to see what DNA connections showed up. According to Ancestry, “ThruLines illustrates how you may be related to your DNA matches through a common ancestor.” It makes it easy to see how others doing research connect to you through DNA. I also wanted to do another post showing my connections to Bairdstown Cemetery so looked at the tombstone photos I’ve taken there. And I wanted to find a random person who I hadn’t connected yet versus one of the many who I already know connect to my Lankford family. I finally settled on Miles A. Caldwell. Miles and I have no common relative but he was the father-in-law of my 1st cousin 3x removed, Katie Mary Wilson Caldwell who was married to his son, Homer Anthony Caldwell. Katie was the daughter of William Oliver Wilson and Mary T. Lankford. Mary Lankford was the daughter of my 3rd great grandparents James Meriweather Lankford and Caroline B. Hobbs which makes her my 2nd great grand aunt. So, there was a connection! Miles A. Caldwell, son of William Miles Caldwell and Mary Ann Caldwell, was born in Alabama on January 17, 1849. He had three brothers and one adopted sister—Cullen Jackson Caldwell, Joshua Augustus Caldwell, John Caldwell, Miles A. Caldwell, and Mary Caldwell. 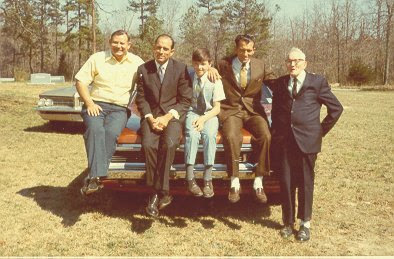 Sometime after Miles was born, his family moved to Alabama. On November 19, 1850, five-month-old Miles and his family lived in District 19 of Chambers County, Alabama. It took me two days to find them in the census records because they were enumerated as the Colwell family, reminding me that you always have to check different spellings. Miles’ father was a farmer and his 15-year-old brother Cullen a student. No one in the family could read or write. There was another Colwell family living next door—Joshua Colwell (62), born in Maryland, his wife Mary (52), and their son Joshua Jr. (18). Both Mary and Joshua Jr. were born in Georgia. I assume they were family but at this point, don’t know what the relationship was. On August 8, 1860, Miles and his family lived in the Southern Division of Chambers County, Alabama. His 46-year-old father worked as an overseer with a personal estate valued at $500. Miles and his 14-year-old brother Joshua were both attending school. I have been unable to find Miles in the 1870 census but they apparently moved back to Georgia between census years 1860 and 1880. On June 3, 1880, Miles lived with his family in District 138 of Greene County, Georgia. His father was a farmer, his mother a housekeeper. Miles’ paternal grandfather was born in Maryland. This record enumerates his 13-year-old sister Mary as adopted. Miles was a farmer. There were two servant women named Martha B. Lester (39) and Jane (20) living in the home along with Judge Lester (14), Elsie Lester (11), Ellen Lester (4), Paul Lester (3 months), Lewis Lester (6), and Pat Lester (4). His brother Cullen lived next door. Miles married Sarah “Sallie” N. Anthony (parents unknown at this point) in Greene County, Georgia on March 11, 1882. Miles and Sallie had seven children—James V. Caldwell, Homer Anthony Caldwell, Abbie M. Caldwell, Estelle Caldwell, and three unknowns. Mrs. Caldwell, the mother of Messrs. Cullen, Miles and Joshua Caldwell died last Friday evening at 2 o’clock and was buried in the cemetery here (Bairdstown) Saturday evening at 3 o’clock. Rev. J. F. Cheney conducted the funeral ceremonies. She was 79 years of age. On June 7, 1900, Miles and his family lived in District 138 of Woodville, Greene County, Georgia. Miles and Sallie had been married for 18 years. Sallie was enumerated as the mother of seven children, four of which were living. Miles was a farmer. All of the children were in school. The only person in the house who was unable to read or write was his mother Sallie. On May 2, 1910, Miles, Sallie, Abbie, and Estelle lived on Bairdstown Road in Woodville, Greene County, Georgia. Miles and Sallie had been married for 28 years. Sallie was again enumerated as the mother of seven children, four of which were living. Miles was a farmer on a general farm. The many friends of Mr. C. J. Caldwell of near Bairdstown regret to learn of his death and burial last week. He was a Mason and a member of Howard lodge at Maxeys. He was seventy-five years old, joined the Baptist church when young and served his country in the Confederacy. The funeral services of Mr. Miles Caldwell was conducted Saturday afternoon here (Bairdstown) by Rev. Robertson. The body was interred in the cemetery. His wife preceded him two months ago. He leaves three children, one son and two daughters to mourn his departure. Brotherhood of Locomotive Firemen and Enginemen; https://en.wikipedia.org/wiki/Brotherhood_of_Locomotive_Firemen_and_Enginemen. Find-A-Grave memorial ID 24042160 for Miles A. Caldwell, 127539871 for James V. Caldwell, and 24042230 for Sallie A. Caldwell. Georgia, Marriage Records From Select Counties, 1828-1978. McRee Jr., Fred W., Oglethorpe County, Georgia Deaths: 1874-1938, 2006. U.S. Federal Census, District 19, Chambers County, Alabama, 1850. U.S. Federal Census, Southern Division, Chambers County, Alabama, 1860. U.S. Federal Census, District 138, Greene County, Georgia, 1880. U.S. Federal Census, District 138, Woodville, Greene County, Georgia, 1900. U.S. Federal Census, District 51, Woodville, Greene County, Georgia, 1910. U.S. Federal Census, Atlanta Ward 1, Fulton, Georgia, 1910. 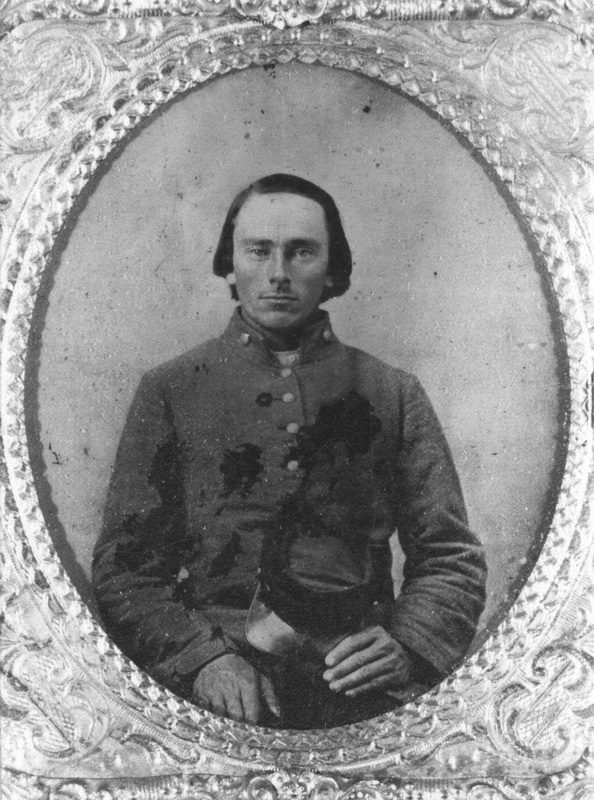 I had full intentions of blogging about my husband’s 2nd great grandfather, Samuel C. Murphy, but decided against it when I pulled out the notebook full of Civil War era papers I have for him. I haven’t figured out who Samuel’s parents are so our Murphy line stops when I get to him. He definitely is one of my brick walls. Since he’s my husband’s direct ancestor, I want to get it right and not rush through his timeline so I’ll save him for later. Instead, I’m writing about Ruth Miller Dudley Chapman, the woman standing in front of a brick wall beside her second husband, Charles Vernon Chapman. Ruth Miller, daughter of William T. Miller and Jessie Graham Waddel, was born on June 7, 1899 in Allegany County, Maryland. She came from a large family of at least 12 children—John Jacob Miller, Clara Jane Miller, Ruth Miller, William Robert Miller (twin), Jessie Graham Miller (twin), Irwin Miller, Florence Miller, Elmer Elsworth Miller, Verna Miller, Clarence Ernest Miller, Thomas Edward Miller, and Esther Miller. She and my husband Charles have no common relative. Family Tree Maker shows she is the wife of uncle of wife of uncle to my husband. On June 18, 1900, Ruth and her family lived in District 15 of Lonaconing, Allegany County, Maryland. Her father worked in the coal mines. Her maternal grandparents were both from Scotland. Ruth was baptized at a Presbyterian Church in Lonaconing on November 3, 1902. Jessie, one of the twins, passed away in 1903 and was buried at Oak Hill Cemetery in Lonaconing. On April 25, 1910, Ruth and her family still lived in Lonanconing, now on Water Clift Street. Her father worked on a driving team, probably at the coal mines. When I looked at the men in her neighborhood, it appears that most of them worked in the coal mine at the time, although her brother John was working as a laborer on a farm. The census enumerator recorded that her mother Jessie had eight children, seven of which were living. That would account for the death of baby Jessie. The family suffered another loss when Ruth’s sister Esther passed away in 1916. She was buried beside baby sister Jessie at Oak Hill Cemetery. On January 12, 1920, Ruth (age 20) and her family lived on Water Street in Lonaconing. Her father was a self-employed carpenter. Ruth, William, and Irwin worked at the silk mill. Ruth’s father William passed away in 1923 and was buried at Oak Hill Cemetery. Sometime between 1920 and 1923, Ruth married Joseph Dudley Jr., son of Joseph Dudley Sr. and Martha West and they moved to Bridgeport, Harrison County, West Virginia. Ruth and Joseph had three children—Bettie Lou Dudley born April 13, 1924, Leah Jo Dudley born July 7, 1926, and Florence Ann Dudley born January 30, 1928. Tragedy struck the family on October 8, 1928 when Joseph was severely wounded in a mine explosion. He died from his injuries the next day. Joseph was buried at the Bridgeport Masonic Cemetery on October 13. The explosion was no accident—his death was ruled a homicide. You can read about Joseph here. With his death, Ruth was left alone to raise their three daughters. Probably needing to be close to her family, she moved back to Lonaconing. On April 4, 1930, Ruth and her daughters lived on Dye Road, not far from her mother’s home on Watercliff Street. Ruth supported her family working as a winder at the silk mill. Six of her siblings were still living with her mother so she had plenty of help taking care of her daughters. On April 11, 1940, Ruth and her daughters lived with her mother, sister Verna, and brother Clarence on Watercliff Street. Ruth still worked at the silk mill. Verna was working as a teacher in a public school and Clarence worked in the printing department at Celanese Corporation. By 1945, Ruth had moved to Long Beach, California. She and daughter Bettie lived at 3933 Virginia Road and worked together at Douglas Aircraft Company in Long Beach. Ruth and her daughters all celebrated a wedding in the late 1940s and 1950s. On June 30, 1946, Ruth traveled back to Lonaconing when her daughter Leah married Elmer Marsh. Ruth’s brother Clarence gave Leah away at the ceremony. Ruth wore a navy-blue dress with a navy-blue hat trimmed in white, and a corsage of gardenias. In 1948, Ruth married Charles Vernon Chapman, son of Granville H. Chapman and Cora C. Taylor. On January 28, 1951, her daughter Bettie married Norman Keith Glass in Las Vegas, Nevada. And daughter Bettie married John M. Lajoie on Julie 23, 1959 in Los Angeles, California. Ruth’s family gathered every year to celebrate her mother’s birthday, a tradition they carried on even after her mother passed away in 1958. Ruth and Vernon were often the hosts of the celebration. Her husband Vernon died on December 18, 1977 and was buried at Rest Lawn Memorial Gardens in La Vale, Allegany County, Maryland. Her daughter Bettie died in San Rafael, Marin, California on January 10, 1986 and was buried at Masonic Cemetery in Bridgeport, Harrison County, West Virginia. Ruth passed away in Lonaconing on September 16, 2000 at the age of 101 years. She was buried beside Vernon at Restlawn Memorial Gardens in La Vale. The photos on this post are part of my husband’s uncle Ralph J. Murphy’s slide collection. If you’d like to see more photos from Uncle Ralph’s collection, click on the links below. Bettie Dudley Is Wed to Norman Glass, “The Cumberland News,” Cumberland, Maryland, March 17, 1951. Betty Lou Dudley, West Virginia, Births Index, 1853-1969. Find-A-Grave, memorial 115830709 for Esther Miller, 115830677 for Jessie G. Miller, 115830227 for William T. Miller, and 111233077 for Ruth Miller Dudley Chapman. Long Beach, California, City Directory, 1945. Merrbach, Marie, Wedding Ceremony Is Solemnized in First Presbyterian Church, “The Cumberland News,” Cumberland, Maryland, July 4, 1946. Murphy, Denise, 52 Ancestors – no. 49: Joseph Dudley Jr. (week 33), Living in the Past blog. U. S. Federal Census, District 17, Lonaconing, Allegany, Maryland, 1910. U. S. Federal Census, District 49, Lonaconing, Allegany, Maryland, 1930. U. S. Federal Census, Lonaconing, Allegany, Maryland, 1900. U. S. Federal Census, Lonaconing, Allegany, Maryland, 1920. U. S. Federal Census, Watercliff, Lonaconing, Allegany, Maryland, 1940. He just wanted to go home! 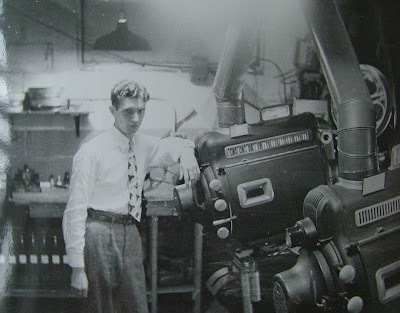 Once upon a time, we had a movie projectionist in the family—my husband’s uncle Ralph Junior Murphy. In 1940, uncle Ralph lived in Littleton, Wetzel County, West Virginia with his parents and siblings Raymond, Glenn, Evelyn, and Earl. When the census enumerator asked 21-year-old Ralph for his occupation, he told him “operator” in the “show” industry. That was corroborated when I found a news article in uncle Ralph’s wallet given to my husband by his aunt Jean Murphy several years ago. Someone had written the year 1940 on the article. Hundred, W. Va., Feb. 17—(AP)—Fifty patrons of this community’s only movie theatre have passes for a show tonight because the operator decided a double-feature bill was “too long” and shut down the projector. Ralph Murphy, the only available operator, closed the show 15 minutes before completion of the second film last night. His only explanation was “too long,” so Miss Isabelle Brown, theatre manager, handed out passes to the patrons so they could see the end of the picture. Unfortunately, I don’t know the name of the newspaper this article was published in. With the help of someone on the Wetzel County, West Virginia Genealogy Facebook page, I learned there were two newspapers in the area at the time—the Wetzel Republican and the Wetzel Democrat. My guess is it would have been published in one or the other. Another item in uncle Ralph’s wallet was a card with just the words “Alpine Theatre Circuit #2” and “Littleton, W.Va.” typed on it. Of course, that was a clue and after a little research, along with more help of someone on the Wetzel County, West Virginia Genealogy Facebook page, I determined that the theatre was the Alpine Theatre located at 1600 Pennsylvania Avenue in Hundred, Wetzel County, West Virginia. Walter Buhl Urling of Alpine Southern Theatres opened the Alpine in the late 1930s. Uncle Ralph was still a projectionist when he enlisted in the U.S. Army in 1941. He would later go on to be the projectionist at Warner’s Skyline Drive-In Theater in Clarksburg, Harrison County, West Virginia. You can read about that here. My husband says uncle Ralph did what Ralph wanted to do so when he was ready to go, he was ready to go! It didn’t surprise him at all when he read this article. Uncle Ralph himself probably got a chuckle when he saw this article “in the paper.” At least he cared enough to save and laminate it. Hundred Operator Had to Go so 50 Get Movie Passes, newspaper unknown, 1940. Motion Picture Herald, vol. 135, issues 1-6, Quigley Publishing Company, 1939. U. S. Federal Census, Clay District, Littleton, Wetzel County, West Virginia, 1940. U.S., World War II Army Enlistment Records, 1938-1946. I spend a lot of time searching the Georgia Historic Newspapers, a free resource provided by the Digital Library of Georgia. If you’re researching families from Georgia and you’re not using this online resource, you’re missing out! I’ve found a lot of good stuff in these newspapers. Some are very informative news articles and some are just nuggets of information, but when pieced together, they help tell the stories we’re all working so hard to write. My 3rd great grandfather, James Meriweather Lankford, was a prominent member of his community (Penfield, Greene County, Georgia) so was often in the news. Since this week’s theme is “12,” I thought I’d see if I could find 12 new things about him. I knew he was a farmer, stock trader, slave owner, and a veteran of the Civil War. It’s turns out, he was quite the businessman in Penfield. Here’s what I learned this week from the Georgia Historic Newspapers. 1. He owned and ran the Penfield Daily Hack. Penfield Daily Hack. The subscriber will convey Passengers from the Depot in Greensboro’ to Penfield, daily, upon the arrival of the Passenger Daily Trains at 11 o’clock, A.M.
Leaving Greensboro’ at 11 ½ o’clock, A.M., and arriving at Penfield by 2 o’clock, P.M.
Leaving Penfield for Greensboro’ at 8 ½ o’clock, A.M., so as to connect with the Trains going East and West. 2. He was a merchant. Tobacco, Segars and Snuff, &c. &c.
Preseves, Lemon Syrup, Oranges, Lemons, Raisins, Figs, Candy, Kisses, Sugar, Plums, Toys, &c. &c.
Sand’s Sarsaparilla, Turpentine, Castor Oil, Sweet Oil, Linseed Oil, Train Oil, Alum, Epsom Salts, Borax, Coione Kathairon, Military Shaving Soap, Cakes Soap, Tarpentine Soap, Essence of Lemon, Essence of Peppermint, do. Rose Water, Landanum, Paregoric, Blacking, Cloves, Lamp Oil, Matches, &c &c.
From the above list it may be seen that our Stock comprises the largest and best selected assortment of Family Groceries, &c. ever offered in this market.—This being the case they can afford to sell for very small profits. Students will find that a portion of the stock has been selected with especial reference to their wants. The subscribers will give their individual attention to all who favor them with their patronage. 3. He owned a livery stable in partnership with W. T. Doster and J. T. Dolvin. The partnership was dissolved in 1855. NOTICE.—The Copartnership heretofore existing under the firm and name of Doster, Lankford & Dolvin, and J. M. Lankford & Co., is this day dissolved by mutual consent. The Books and accounts of Doster & Lankford, Dolvin, Lankford & Dolvin, and J. M. Lankford & Co., are in the hands of J. M. Lankford for collection. All persons indebted will please come forward and settle and save cost. Having this day bought the interest of J. M. Lankford in the firm of Doster, Lankford & Dolvin, and J. M. Lankford & Co., I now inform the public that the Livery Stable business will be continue in the name of Doster & Dolvin. 4. He was elected Constable of his district in 1856. County Elections, On Monday, the 7th inst., E. L. King was elected Ordinary; A. T. Scott, Tax Collector; Wm. English, Receiver; V. Sanford, Clerk; A. L. Willis, Justice of the Inferior Court; and J. G. Holtzclaw, Surveyor. On the 5th inst., James M. Lankford, Esq., was elected Constable of our District by an overwhelming majority. 5. He sold Sarsaparilla extract to the public, presumably from the Williams & Lankford store. HELMBOLD’S HIGHLY CONCENTRATED Compound Fluid Extract Sarsaparilla. For Purifying the Blood, removing all diseases arising from excess of Mercury, exposure and imprudence in life, chronic constitutional disease, arising from an impure state of the Blood, and the only reliable and effectual known remedy for the cure of Scrofula, Salt Rheum, Scald Head, Ulcerations of the Throat and Legs, Pains and Swellings of the Bones, Tetter, Pimples on the Face, and all Scaly Eruptions of the Skin. This article is now prescribed by some of the most distinguished physicians in the country, and has proved more efficient in practice than any preparation of Sarsaparilla yet offered to the public. Several cases of secondary Syphilis, Mercurial and Scrofulous diseases have entirely recovered in the incurable wards of our Public Institutions which had for many years resisted every mode of treatment that could be devised. These cases furnish striking examples of the salutary effects of this medicine in arresting some of the most inveterate diseases, after the glands were destroyed, and the bones already affected. Notice.—Letters from responsible Physicians and Professors of several Medical Colleges, and certificates of cures from patients will be found accompanying both Preparations. Prices—Fluid Extract of Buchu, $1 per bottle, or 6 bottles for $5, Fluid Extract of Sarsaparilla, $1 per bottle, or 6 bottles for $5, equal in strength to one gallon of Syrup or Sarsaparilla. Prepared and sold by H. T. HELMBOLD, Chemist, 168 Chesnut Street, near the Girard House, Philadelphia. To be had of JAMES M. LANKFORD, Penfield. And of Druggists and Dealers everywhere. All letters directed to the Proprietor or Agent receive immediate attention. 6. He sold M’Lane’s Vermifuge, a medicine used to expel worms from the body, again presumably from the Williams & Lankford store. Temperance Crusader, Penfield, Georgia, November 29, 1856. Worms, Worms, Worms. A great many learned treaties have been written, explaining the origin of, and classifying the worms generated in the human system. Scarcely any topic of medical science has elicited more acute observation and profound research; and yet physicians are very much divided in opinion on the subject. It must be admitted, however, that after all, a mode of expelling them and purifying the body from their presence is of more value than the wisest, disquisitions as to their origin. New York, October 15th, 1852. This is to certify that I was troubled with worms for more than a year. I was advised to use M’Lane’s Celebrated Vermifuge, prepared by Flemming Bros. of Pittsburg. I took one bottle, which brought away about fifty worms; I commenced improving at once, and am now perfectly well. The public can learn my name, and further particulars, by applying to Mrs. Hardie, No. 3 Manhatten place, or E. L. Theall, Druggist, corner of Rutger and Monroe sts. Purchasers will be careful to ask for Dr. M’Lane’s Celebrated Vermifuge, manufactured by Fleming Bros. of Pittsburg, Pa. All other Vermifuge in comparison are worthless. Dr. M’Lane’s genuine Vermifuge, also his celebrated Liver Pills, can now be had at all the respectable drug stores.—None genuine without the signature of FLEMING BROS.
Sold by J. M. Lankford, Penfield: and W. Griffin, Greenesboro, and by one agent in every town in the South. 7. He and J. W. Jackson ran a daily hack line from Penfield to Greensboro, Georgia. They also had livery stables in both cities. TO THE TRAVELING PUBLIC. Having bought out the HACK LINE from Messrs. Wilson & Thompson, the undersigned now run a Daily Line from Penfield to Greenesboro’, connecting with the daily passenger trains. They also have Livery Stables in both places, where they are prepared to accommodate persons with Horses and Buggies to go to any point they may desire. With good Carriages and harness, gentle Horses, sober drivers, and reasonable prices, they respectfully solicit a liberal share of public patronage. Having learned the folly of a contrary course they will require the cash in all cases. J. W. Jackson will always be found at Willis’ Hotel, Greenesboro’, and J. M. Lankford, at their Stables in Penfield. 8. He ran another livery stable with Messrs. Wilson and Raden. They dissolved the business in 1857. Notice.—The firm of Lankford, Wilson & Raden has this day been dissolved by mutual consent, and no debts made against this firm will be paid after this date. All persons having claims against said firm will present them to James M. Lankford, and all persons indebted to said firm will come forward and pay up, as the cash we are compelled to have to pay our debts. LANKFORD, WILSON & RADEN, December 5th, 1857. 9. Joseph Raden sold his part of the livery stable to satisfy a mortgage to James M. Lankford. I enjoyed this notice because it provides details of the inventory the men had in their livery stable. Greene Mortgage Sales. Will be sold in the City of Greenesboro’ on the first Tuesday in February next, between the usual hours of sale, the Interest of Joseph N. Raden in the Livery Stable of Lankford, Wilson and Raden. It being the sixth part of said firm, the following property to-wit: Two old grey Horses known as the Ellington horses, two black Horses known as the Williams horses, two black Mules. One bay horse known as the Sharp horse; one sorrel Horse known as the Grady sorrel; one bay horse known as the Jackson horse; one sorrel known as pot gut; one bay horse known as the lame bay; one grey horse known as the Jackson grey. Seven buggies and harness; Four hacks and harness; one two Horse Wagon and harness; one one Horse wagon and Harness; one four seated Buggy and harness, all levied on as the property of Joseph N. Raden to satisfy a mortgage fi fa in favor of James M. Lankford issued from Greene Inferior Court against said Raden. T. F. Foster, D. Sheriff. Greenesboro’ Nov. 14th, 1857. 10. His son was wounded and it was reported that his hand might have to be amputated. A week later, the newspaper retracted part of the story saying that it was a mistake to report that amputation was a possibility. The injured person could have been my 2nd great grandfather James C. Lankford. Planters’ Weekly, Greensboro, Georgia, May 9, 1860. A son of Mr. James M. Lankford of this County, was badly wounded in the wrist by the accidental discharge of his gun on Saturday last. The physicians think amputation necessary. It seems to be the misfortune of our County, that we have more distressing accidents, more Coroner’s inquests, more murders, more hoaxes to chronicle, than any other county paper in the State. Planters’ Weekly, Greensboro, Georgia, May 16, 1860. We were in error last week, when we said, that the physicians thought amputation of the hand necessary for Mr. Lankford’s son, who had been wounded by the accidental discharge of his gun. They never thought or said so, and our mistake was in publishing the first report which reached us. 11. He bought the States right to a rotating harrow in 1860, an implement that was pulled by a horse or mull to break up clods of dirt, etc. Planters’ Weekly, Greensboro, Georgia, April 3, 1861. The First premium Harrow of the empire and Green Mountain States. The Harrow that has taken the premium, at every State and County fair where it has been exhibited and Tested. I wish to inform the citizen of Greene and the adjoining Counties, that I have bought the “STATES RIGHT” to the above Harrow; and that I am manufacturing them at PENFIELD GEORGIA. Any person wishing to purchase a Harrow, can take it on his plantation and if it does not suit he may return it, and I will charge him nothing. It is the very thing for leveling the land, and breaking clods, consequently is invaluable in putting in wheat. 12. He was a realtor of some sort. For Sale or Rent. A comfortable house and lot in Penfield, situated in the eastern part of town. It contains four good Rooms—all the outbuildings are in good repair, and a small family will find it to be a pleasant residence. Mr. Henry English occupied it during the past year. Apply to J. M. Lankford. Penfield, Ga.
Penfield Daily Hack, “Daily Chronicle & Sentinel,” Augusta, Georgia, February 4, 1852. Large Sales & Small Profits, “The Temperance Banner,” Penfield, Georgia, June 10, 1854. Notice, “The Temperance Banner,” Penfield, Georgia, December 1, 1855. County Elections, “Temperance Crusader,” Penfield, Georgia, January 12, 1856. Helmbold’s Highly Concentrated Compound Fluid Extract Sarsaparilla, “Temperance Crusader,” Penfield, Georgia, February 2, 1856. Worms, Worms, Worms, “Temperance Crusader,” Penfield, Georgia, November 29, 1856. To the Traveling Public, “Temperance Crusader,” Penfield, Georgia, February 19, 1857. Notice, “Temperance Crusader,” Penfield, Georgia, December 17, 1857. Greene Mortgage Sales, “Temperance Crusader,” Penfield, Georgia, December 17, 1857. “Planters’ Weekly,” Greensboro, Georgia, May 9, 1860. “Planters’ Weekly,” Greensboro, Georgia, May 16, 1860. DeWitt & Barrett’s, Rotating Harrow, “Planters’ Weekly,” Greensboro, Georgia, April 3, 1861. For Sale or Rent, “The Georgia Temperance Crusader,” Penfield, Georgia, February 4, 1858. 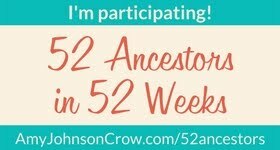 The 52 Ancestors theme this week is “large family.” For this theme, to kill two birds with one stone I chose to write about Elizabeth Ann Lankford. I’m sure if I looked, I could have found someone with a larger family than hers but I’ve been lax about my goal to document the souls buried at Bairdstown Cemetery in Bairdstown, Oglethorpe County, Georgia and this post will cover both. Elizabeth Ann Lankford, daughter of Charles L. Lankford and Miss Moore, was born January 1822 in Bairdstown, Oglethorpe County, Georgia. She was the third child of five—William A. Lankford, James Meriweather Lankford, Elizabeth Ann Lankford, Curtis Caldwell Lankford, and Robert Chester Lankford. Elizabeth was the only sister of my 3rd great-grandfather, James M. Lankford, which makes her my 3rd great grand aunt. Other than census records with the rest of her family, I find no other records for Elizabeth until she married William H. Bryant Sr. on December 13, 1841. She was 19 years old and he was 20. I find the records for the location of their marriage confusing though. The database “Georgia, Marriage Records from Select Counties, 1828-1978” has two different records for the location of their marriage. One from Greene County that doesn’t actually show they were married there. The section of the form where the justice of the peace is supposed to write the date they “were joined together in the Holy Bands of Matrimony, by me” was left blank. Did they go to Greene County to get the application and then get married in Oglethorpe County? Hard to say 177 years later. Elizabeth and William had 10 children together—Sarah T. Bryant, Samuel R. (or John) Bryant, Rebecca M. Bryant, William H. Bryant Jr., Alexander Hamilton Bryant, Charles Bryant, Martha Bryant, Eugene Herbert Bryant, Jasper M. Bryant, and Mary Bryant. For a while, I thought there were 11 children because if you go through census records you find 11 named children. But based on the fact that the 1900 census record recorded Elizabeth as having had 10 children with 9 living at the time, I’m now going with 10. I mean, she would have known how many children she’d given birth to, right? One could also argue that the census enumerator recorded the children with different names on several occasions so perhaps that was what happened here. I’m thinking Samuel and John are possibly the same child. I have found no record to prove otherwise. If someone does, I’d love to hear from them. On August 3, 1850, Elizabeth, William, and their four children—Sarah, Samuel, Rebecca, and William—lived in the 66th Division of Oglethorpe County. The census enumerator marked the column noting that William was unable to read or write. Their home was a large farm made up of 289 acres of improved land with an additional 100 acres of unimproved land. The value of their farming equipment and machines was $2,500. Livestock consisted of 100 horses, 3 mules, 4 working oxen, 2 cows, 11 sheep, and 8 pigs, all valued at $60. Can you imagine what all that livestock would be worth today! The farm produced 400 bushels of wheat, 50 bushels of rye, 500 bushels of oats, 130 bushels of rice, 11 bales of cotton, 52 bushels of peas and beans, 100 bushels of sweet potatoes, 150 pounds of butter, and 5 tons of hay. They stayed busy. But as an overseer, I’m not sure how William was able to keep records for his large farm if he was unable to read and write. On June 29, 1860, Elizabeth and her growing family of nine children lived in District 238 of Oglethorpe County. The enumerator spelled their last name “Briant.” He also listed a two-month-old unnamed male child in the home. Elizabeth had recently given birth to a son they named Jasper so that has to be him. William was a farmer with a personal estate valued at $300. On June 1, 1870, Elizabeth and her family lived in Maxeys, Oglethorpe County. She was enumerated as Eliza and was keeping house. William was a farmer with land valued at $2,000 and a personal estate valued at $1,000. Their son Eugene was enumerated as Henry, Jasper enumerated as James, and Alexander as Adam. At ages 12 and 10 respectively, Eugene and Jasper were unable to read and write. Three adult children still lived at home—Sarah (age 27), Rebecca (age 23), and William Jr. (age 21). William Jr., enumerated as a farm laborer, must have been helping on the farm. William Colclough, a 19-year-old male, lived in the home and was also a farm laborer. Three William’s living in the home at the same time. That must have gotten confusing at times! On June 29, 1880, Elizabeth and her family lived in Woodstock, Oglethorpe County. William was a farmer, managing 25 acres of land and livestock. He rented out part of the land to tenants who gave him a share of their crops for using the land. There were seven adults living in the home—Elizabeth, William, Sarah (37), Rebecca (27), Mattie (24), Herbert (22), Jasper (20), and teenager Mary (17). Herbert and Jasper were farm laborers so can we assume they helped their father on the farm? A servant named Rhoda Drake, age 16, lived in the home as well. Their son Alexander (Alex), his wife Lizzie (Epps), and two daughters (Kate and a three-month old infant) lived three houses away. In the early 1880s, Elizabeth’s son William Jr. left Georgia and headed west to Texas. In 1886, he met and married Annie Laura Jones after a short courtship. They had two children, a son named Charles Leonard Bryant in 1890, and a daughter named Mary Lee Bryant in 1892. When Mary was two months old, Laura contracted pneumonia and passed away. William Jr., unable to care for a newborn, left Mary with Laura’s mother, Fannie Catherine Findley Jones, and went home to the Bryant family farm in Maxeys with his son Charles. Years later, Charles would write that “They never lived together as a family again.” William Jr. didn’t stay home long though. He left the family farm again, this time leaving his son Charles in the care of his sister Rebecca, who apparently was still living at home. I’m assuming that this was after Elizabeth had passed away since it was Rebecca who cared for Charles. An 1894 map of Oglethorpe County shows the Bryant farm in the Falling Creek district, near Bairdstown, just over the Greene County line. On June 5, 1900, Elizabeth, William, and three adult children—Sarah, Rebecca, and Jasper—lived in the Falling Creek District of Maxeys, probably the one shown on the 1894 map. Elizabeth and William had been married for 58 years. This is the census record that shows Elizabeth as the mother of 10 children with 9 living and the only record I have found that shows the month she was born. At age 79, William was still farming with their son Jasper helping. Sarah and Rebecca were both dressmakers. Elizabeth’s son Eugene and his family lived three houses away. The grim monster, death, invaded the home of Mrs. William Bryant, near here (Maxeys) Wednesday of last week and claimed her as his own. She was laid to rest in the Bairdstown cemetery Thursday following after appropriate services by Rev J. D. Mell. You have to walk the full length of Bairdstown Cemetery to get to the Bryant family plot, located at the far-right edge by the woods. Some of Elizabeth’s large family of 12 are buried in the family plot with her and William, together forever. Bairdstown Cemetery is a small, well-kept country cemetery. I’ve walked it many times, usually with my Daddy, and I always make a point of stopping by each of my 3rd great-grandfather’s sibling’s family plots. I’ve researched them enough that I feel like I know them now. Daddy and I have talked about all the Lankford family connections there and I’ve made it a goal to figure them out. Elizabeth Lankford Bryant is one of those connections. I would love to walk Bairdstown Cemetery with Daddy one more time and tell him the stories I’ve learned about the souls buried there. But Daddy will be 93 later this month and is no longer able to walk the cemeteries with me. So instead, I’ll tell anyone who wants to listen here on my blog. Click here to view other connections to Bairdstown Cemetery. Certificate of Death, Georgia Department of Public Health, Bureau of Vital Statistics, W. H. Bryant, no. 33 20959, Georgia Marriages, 1699-1944. Map of Oglethorpe County, Georgia, published by Chicago: Rand, McNally & Co. Engravers, 1894; http://vault.georgiaarchives.org/cdm/ref/collection/cmf/id/217. Moorman, Pamela Taylor, Bryant Family Connections, June 2007. U.S. Federal Census Non-Population Schedule, Division 66, Oglethorpe, Georgia, August 20, 1850. U.S. Federal Census, District 230, Oglethorpe, Georgia, 1880. U.S. Federal Census, Division 66, Oglethorpe County, Georgia, 1850. U.S. Federal Census, Falling Creek, Oglethorpe, Georgia, 1900. U.S. Federal Census, Georgia Militia District 238, Oglethorpe, Georgia, 1860. U.S. Federal Census, Maxeys, Oglethorpe, Georgia, 1870. 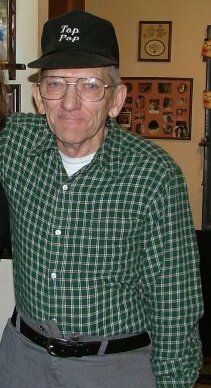 My uncle, Clark Eugene Lankford, was a kind, sweet man. He was always good to me, my sisters Bonita, Jennifer, and Vanessa, and my brother Michael. Bonita remembers that Clark was never sad or mad. He was always smiling and cutting up. Clark came to live with us at our house on Macon Drive in southeast Atlanta, Georgia after he left the U.S. Army. According to his obituary, that would have been 1961. He had spent time in Korea and brought a scrapbook and a decorative pillow home with him. Bonita remembers the scrapbook had photos of Korean women which she believes were thrown away years later immediately after he got married. Ha, my father-in-law had to do the same thing! I remember playing with the pillow in his bedroom. Both the scrapbook and pillow were very decorative. During the years that Clark lived with us, he gave Mama $10 a week to wash his clothes and make his bed. Mama used that money to buy herself a car. At some point, the car was parked in our driveway or on the street and was totaled after being hit by another car. After the accident, Clark let Mama use his red convertible to run errands during the week. At the end of the week, Mama would wash the car before she gave it back to Clark. 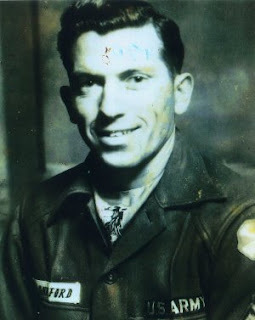 He and Daddy were plumbers and worked together for Thompson Brothers Plumbing in Atlanta or Decatur. Clark must have ridden to work with Daddy for him to be able to let Mama use his car. Most days, Mama packed lunches for both Daddy and Clark. Growing up, we didn’t have the traditional family environment. Mama bent over backwards to make sure we had fun and stayed busy. Daddy on the other hand was a self-described loner. He worked all day and after work he’d spend his evenings working in the yard. We always had beautiful flowers and a big vegetable garden. But when it came to family activities, most times he didn’t participate. So, Clark stepped in and filled the void. my grandma was buried in 1970. On several occasions, Mama and Clark took us to Shakey’s Pizza Parlor for pizza and beer. Well, Mama and Clark had a beer in an ice-cold frozen mug. The kids got a Coke. We’d stand on the benches underneath the windows to watch the staff make the pizzas. Then we’d all sit down and eat pizza while we listened to the piano and banjo players play Dixieland jazz. We had a ball! Jennifer remembers that Clark would take any of us who wanted to go to Greene County when he went to visit our grandparents and aunt. He always stopped at McDonalds and we’d sing and play games on the ride there. During the summer months, Mama went to the farmer’s market and brought back bushel bags of peas for canning. We’d all sit on the back-porch shelling peas until our fingers turned purple. Clark was right there helping us. On Christmas morning, we couldn’t check out what Santa left us until we woke Clark up. At Easter, he helped us hunt eggs. Bonita remembers Clark emptying the change out of his pockets every night when he got home from work. He’d save the change and every few months, we would sit around the dining table and help him roll it up. She believes he used that money as a down payment on his first house. Daddy would sometimes take us to the Miss Georgia ice cream parlor on Lakewood Avenue on Sunday afternoons. Clark would go with us. Every Saturday night Clark went to a dance club in DeKalb County called The Sports Arena. Bonita remembers that it wasn’t a bar, although it may have had beer. Jennifer said they sometimes had wrestling and he loved it. He wanted to take Bonita, but Daddy wouldn’t let him. Clark had a girlfriend for many years. None of us remember her name but she had children our age. Sometimes on Saturdays, he’d take us to her house to play with her kids. We’d go to the park and have picnics with them. Clark would sometimes take her to The Sports Arena on Saturday nights. Clark eventually moved out into a small house a couple of miles from ours, behind the Southeastern Fair Grounds in Atlanta. On weekends, he’d come pick us up and take us to his house. We’d help him clean his house, cut grass, and wash his car. His house was always immaculate. I remember music playing and still today if I hear the songs “Corinna, Corinna” by Ray Peterson from 1960 or “Return to Sender” by Elvis Presley from 1962, I think of Clark. In 1970, at the age of 37, Clark married my aunt Alice and they moved to Alpharetta, north of Atlanta. They had twin daughters whom he loved dearly. The night they were born, Mama and Jennifer went to the hospital and sat up all night with Clark. Jennifer remembers that he was a nervous wreck yet so excited. The twins weren’t born that night and at daylight, Mama and Jennifer had to leave so Mama could go to work. By the time they arrived home, Clark had already called Daddy and told him they were born right after Mama and Jennifer left. The girls were the light of his life. When Jennifer graduated in 1972, Daddy wouldn’t go, and she remembers that she cried like a baby. Clark felt bad for Jennifer, so he and Alice attended her graduation. She always remembered him for that. Clark and Alice eventually moved next door to Daddy in Riverdale, 10 miles south of Atlanta. Daddy and Clark were best friends and they looked out for each other. 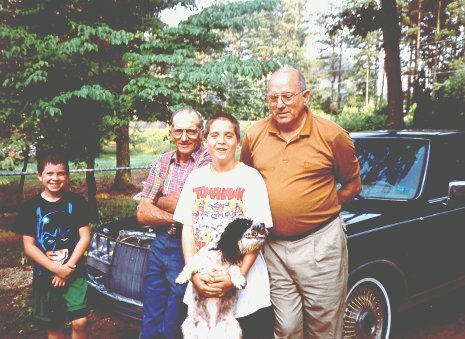 Those years were comforting for me because Daddy was getting older and lived alone. Alice died in 2004 and Clark in 2009. Both are buried at Bairdstown Cemetery in Bairdstown, Oglethorpe County, Georgia near my grandparents, Carroll and Floria Lankford. Appropriately, when Daddy is called home, he’ll be buried beside Clark at Bairdstown. We all have great memories of my uncle Clark. For a few years, he was our “bachelor” uncle who loved us, and we loved him. He was like a second father to us. My thanks to Mama, Bonita, and Jennifer who shared their memories of Clark with me for this post. My sisters remember a lot more than I do! 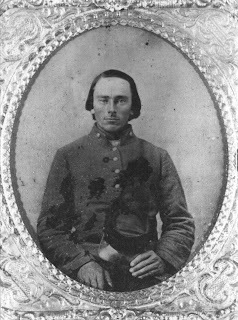 Leeroy Thomas Holland, volunteered and served 4 years in Confederate Army of Virginia 1860 to 1864 and was in nearly all of the battles fought in that part of the confederacy. He was registered in the Army under “Company L” Second South Carolina Rifles, Jenkins Brigade. He was with General Lee when he surrendered at Appomattox Court House Virginia April 9, 1865. The BEARER, Private L. T. Holland, of Co. L 2nd Regt. of S.C. Rifles, a Paroled Prisoner of the Army of Northern Virginia, has permission to go to his home, and there remain undisturbed. It was signed by Col. Robert E. Bowen of the 2nd South Carolina Rifles. In looking through a box of genealogy related papers last weekend, I came across this pass and knew it had to be my post for the “at the Courthouse” theme since I hadn’t included it in my previous posts about Leroy. The pass would have been important to Leroy and clearly places him at the court house that day. National Park Service, Appomattox Court House, National Historical Park Virginia, The Appomattox Campaign; https://www.nps.gov/apco/appomattox-campaign.htm; Paroling the Army of Northern Virginia, https://www.nps.gov/apco/learn/historyculture/paroling-the-army-of-northern-virginia.htm.